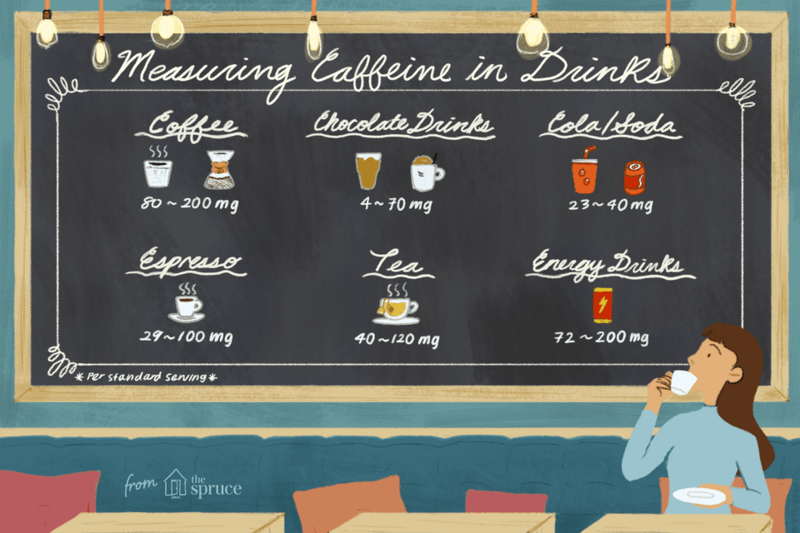 How Much Caffeine Is in Coffee, Tea, Cola, and Other Drinks? The amount of caffeine in your favorite beverage is not as obvious as you might think. Coffee, tea, yerba mate, and chocolate all naturally contain varying amounts of caffeine. By comparison, colas and energy drinks have specific amounts of caffeine added to them, so it's easier to know how much caffeine is in them. This guide outlines how much caffeine is in each of these drinks, including decaf coffee and tea, sodas, popular energy drinks, bottled iced teas, Starbucks coffees, herbal teas (or tisanes), and more. Caffeine is measured in milligrams (mg). For healthy adults, the FDA says consuming up to 400 milligrams per day is not generally associated with negative effects. Many factors influence caffeine levels in coffee, so the amounts for each drink can vary widely. However, this general guide can help you determine approximately how much caffeine is in your coffee drink. Espresso is generally lower in caffeine than drip brewed coffee. There are many factors influencing caffeine levels in tea, including brewing time, brewing temperature, tea grade, and tea varietal. Tisanes or "herbal teas" (including many of Celestial Seasonings' "teas") are usually caffeine free. Similarly, teas blended with other ingredients (such as mint green teas or masala chai) will often have lower caffeine levels than unblended teas. Most studies show that black tea has between 40 and 120 mg caffeine per 8-ounce serving. Decaf black tea usually contains about 2-10 mg of caffeine. Green tea. usually contains around 25 milligrams of caffeine per 8-ounce serving. It's about half of the amount of caffeine found in a typical cup of black tea and one-quarter of the amount found in a typical cup of coffee. Starbucks tea and chocolate drinks caffeine levels vary. Depending on how you brew homemade iced tea, it will contain varying amounts of caffeine. However, iced teas often contain a similar amount of caffeine to their hot tea counterparts. True iced teas (iced teas made with caffeine-containing Camellia sinensis) contain caffeine. Caffeine-free iced herbal tea is made with rooibos, chamomile, and other caffeine-free herbs. Snapple's Red Tea line is made with rooibos and is naturally caffeine-free. Snapple's Diet Green Teas contain 60 mg of caffeine per bottle, while their regular Green Teas contain 30 mg of caffeine per bottle and their White Teas contain less than 1 mg of caffeine per serving. (There are two exceptions to this—Lime Green and Diet Lime Green both contain 5 mg of caffeine per serving or 10 mg of caffeine per bottle.) Snapple's Just Plain Unsweetened and Lemonade Iced Tea both contain 18 mg of caffeine per bottle. All Arizona iced teas contain caffeine. Their black teas have 15 mg of caffeine per 8-ounce serving. Their green teas contain 7.5 mg caffeine per serving. Their white teas contain 6 mg caffeine per serving. Caffeine-free sodas include Mugg Root Beer, 7-Up, Sprite, Fresca, Fanta (all flavors), Slice, and Sierra Mist. Energy drinks are high in caffeine, with some being very concentrated.